Check The Pilot System In Your Gas Fireplace | FREE infographic included! Step-by-step instructions show you how to check the pilot system in your gas fireplace. Whether you have a standing pilot or electronic ignition system, Fast Replacement Glass can help. Free infographic included! As much as we refuse to admit it, we are halfway through the summer and cooler temperatures will inevitably be upon us in a few months. Chin up! There are lots of great things about fall to look forward to: football, apple picking, hayrides, corn mazes, and snuggling up in front of your cozy gas fireplace with a mug of something warm! That being said, now is a terrific time to get ahead on your honey-do list and cross off a few things in preparation for the upcoming heating season. In addition to the routine maintenance items like checking your gaskets and glass, there is a task that should be at the top of your list. 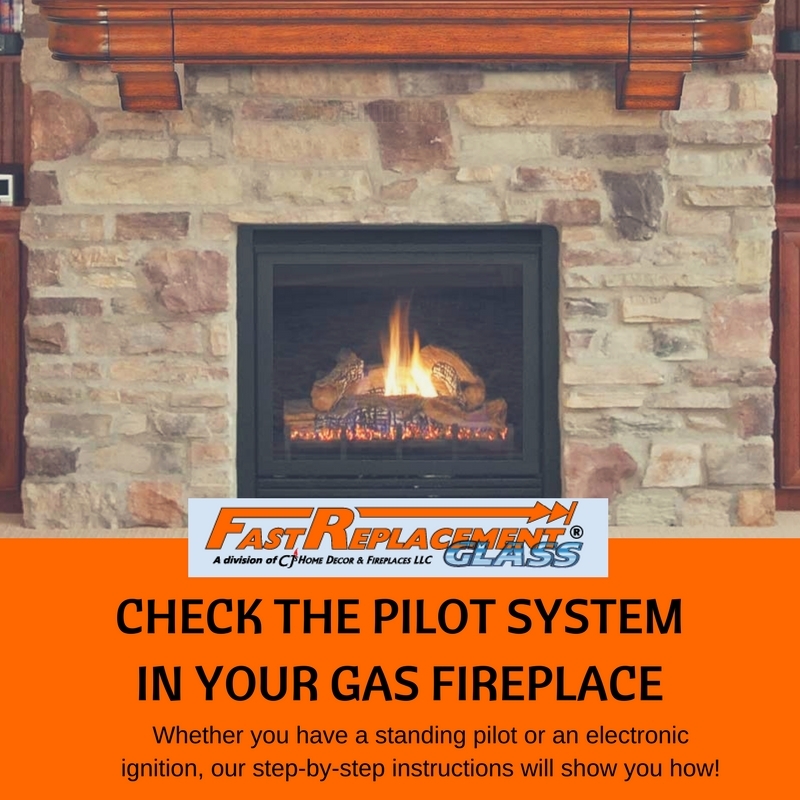 While checking your gas fireplace pilot system is an extremely easy and quick thing to do, it is most often overlooked in the seasonal upkeep of heating appliances. As you know, Fast Replacement Glass is one of the premier leaders in the fireplace industry for all your glass window needs. If you are new to our website, let us be the first to tell you that we also have over 30 years combined experience with all types of heating sources! We believe in providing our customers with terrific service, and this goes double for supplying you with important information about operating and maintaining your application. The goal of this blog article is to give you step-by-step instructions on how to check the pilot system on a typical Heat & Glo gas fireplace. Since every fireplace manufacturer has their own designs and configurations, your application may very well be quite different from the information and pictures that we are showing here. Please be advised: we highly recommend reading your owner's manual thoroughly in conjunction with following our directions. Our instructions are meant to be supplemental information only; they are not meant to substitute or replace the dialog in your fireplace owner's manual. It is always necessary to follow the manufacturer's directions first. If you have any questions, you can always refer to the customer service hotline in your manual or contact a certified gas technician. What Type Of Pilot System Do I Have? If you're not a fireplace guru, or perhaps you just moved into a home and have never had a gas fireplace before, we can help you determine what type of pilot system you have with just a few simple steps! First: be sure your fireplace is cool! Remove the decorative front and glass assembly. Lay them down and out of the way on a soft or blanketed surface. If you see only one knob that allows you to adjust the flame height (low to high), then you have an intermittent pilot system, or what is sometimes referred to as electronic ignition. What this means is that as soon as you turn your fireplace on (via remote or wall switch), the pilot lights automatically. This also means that your pilot is not on continuously, which provides an extra level of security and cuts down on wasted fuel tremendously. However, if you see a control knob that has a hash mark and three settings (OFF, PILOT, and ON), as well as a flame height adjusting knob and a push button (this is the igniter), then you have a standing pilot system. This means that the pilot light (a small gas flame) is always on, much like the older style gas stoves and furnaces. To adjust your control knob between the settings, you must push the knob in and turn it so that the desired setting is in line with the hash mark. Now that you've determined which type of pilot that you have, we're going to walk you through a system check to ensure that everything is working as it should! Test the igniter first by pushing the ignition button three or four times to check for a spark. Push in the control knob and rotate it so that PILOT is in line with the hash mark. Press the igniter button until the pilot turns on. Continue holding the control knob in for 30 seconds after the pilot lights before releasing. Push the knob in and rotate it again so that ON is in line with the hash mark (see picture at right). Carefully reassemble your glass and decorative front. Press the igniter button again, several times, until the pilot turns on. If the pilot turns on, continue holding the control knob in for 30 seconds after the pilot lights before releasing. Then push the knob in and rotate it again so that ON is in line with the hash mark. Carefully reassemble your glass and decorative front. If the pilot light does not turn on, stop what you are doing. Wait 5 minutes and try the above 2 steps again. If the pilot is still not lighting, push in the control knob and rotate it so that OFF is in line with the hash mark and call a gas service professional to inspect and repair your pilot system. Test the ignition first by attempting to turn on your fireplace. Look into the fireplace and check for a spark. If you see a spark and your fireplace starts up automatically, you are in good shape! Check to make sure that the power source for the ignition is plugged in. Verify that power is going to the fireplace. Make sure your gas supply to the fireplace is on. You can easily determine this by inspecting the gas shut off valve, which is located underneath the firebox and next to the control valve. The quarter-turn handle on the valve should be either bright red or blue. Turn your gas valve to the OFF position and call a certified gas professional for a safe and quick inspection of your gas fireplace. As we stated, a standing pilot means that the gas is always on in your natural gas or propane appliance. Unfortunately, this is quite wasteful when it comes to fuel conservation. In an effort to conserve energy and make all gas appliances more efficient, a new regulatory action for standing pilot lights is currently being reviewed by the U.S. Department of Energy, while the HPBA (Hearth, Patio, & Barbecue Association) is also attempting to revise the standards for all heating, cooking, and decorative gas appliances. HPBA has proposed that the manufacturing of products with a standing pilot be phased out by mid-2019. With all of the new innovations and energy-conscious gas appliances that exist today, homeowners can focus more on the warmth and convenience of their stoves, fireplaces, furnaces and more. It is the goal of the HPBA, in conjunction with the U.S. Department of Energy, to make all gas appliances safer and more efficient. Check out the HPBA website for more information! 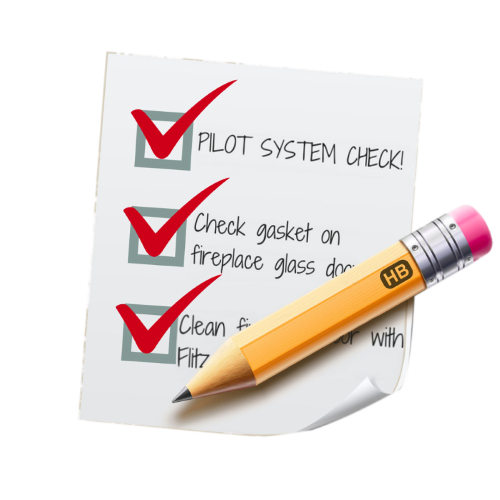 Fast Replacement Glass wants to make sure your pilot system check takes priority at the top of your list this season. It could save you a lot of stress and scheduling constraints this fall!